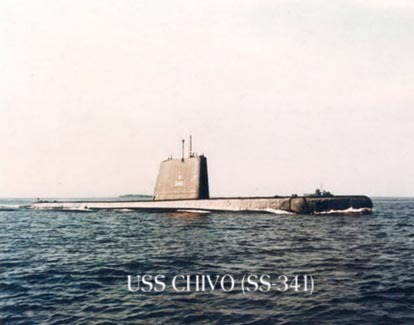 Chivo (SS-341) was launched 14 January 1945 by Electric Boat Company Groton Conn.; sponsored by Mrs. R. E. Baldwin wife of the governor of Connecticut; and commissioned 28 April 1945 Lieutenant Commander W. B. Crutcher USNR in command. Chivo departed New London 7 June 1945 for Key West where she trained and exercised briefly before sailing on to Pearl Harbor. While the submarine was preparing for her first war patrol hostilities ended; Chivo then remained at Pearl Harbor operating locally with other ships of the Pacific Fleet. She returned to the States in October basing on San Diego for local operations which continued until January 1946 when Chivo sailed for a tour of duty in the western Pacific. Returning to San Diego in May the submarine exercised along the west coast for the next 15 months. In August 1947 Chivo began a simulated war patrol which took her to Suva Fiji Islands; Guam and Japan before she arrived back at San Diego in November. West coast duty continued for her until mid-1949 when she was transferred to the Atlantic Fleet arriving at her new home port of Key West on 4 July 1949. The submarine continued to train and provide services for other ships in intertype exercises until 30 October 1950 when she arrived at New London to begin an extensive overhaul and modernization. With increased power and a new streamlined shape Chivo returned to duty with the Atlantic Fleet in July 1951. Since that time based on Key West and Charleston (1959) she has participated in exercises and tests off the east coast through 1963. Interspersed among her regular operations have been a tour of duty with the 6th Fleet in the Mediterranean (1952) and visits to the Pacific Coast of Colombia (1953) Quebec City Canada (1959) and South Africa (1960).